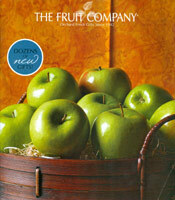 Enjoy the world's finest orchard fresh fruit selections from The Fruit Company! Buy fruit online and gift your loved ones with a gourmet fruit basket, gift fruit towers, gift boxes and dozens of other glorious edible fruit arrangements to choose from! Edible fruit arrangement - When it comes to fresh produce, don't settle for anything other than the World's Finest. Buy fruit online from scrumptious Navel Orange fruit to Honeycrisp Apple fruit, Asian Pears, and more! For a fruit gift basket they'll never forget, count on a beautiful edible fruit arrangement from The Fruit Company that will surely put a smile on any fruit lover's face. Gourmet fruit basket - Fill them with Christmas cheer when you hand them the Snowman's Delight gourmet fruit basket they'll crave every year! Find Christmas fruit gift baskets that are perfect for holiday gift exchanges or a fresh fruit basket for an exquisite birthday or thank you gift, featuring 25 delectable fruit gift baskets to choose from! Don't forget all of their gourmet food, such as hand-milled cheeses, gourmet chocolates, roasted nuts and beef summer sausage - just a few of the goodies included in their many fruit baskets! Dried fruit gifts - Perfect for entertaining or to give as a special fruit gift, sink your teeth into The Fruit Company's dried fruit platter featuring a selection of tasty dried delicacies. Brimming with delicious dried mango fruit, kiwi fruit, pineapple fruit and hearty pistachio nuts, their dried Fruit and Nut Tray makes the perfect gift no matter what the occasion. Fruit of the Month Club - Enjoy membership to the exclusive HarvestClub for mouth watering orchard fresh fruit delivered conveniently to your door or gift recipient's door every month! Fruits are chosen during their prime peak of flavor and delivered in an exclusive Watercolor Art Box. Become a member of the Monthly Harvest Club and enjoy the season's best fruit all year long! Exotica Harvest Club - For those fruit lovers who are a little more adventurous, The Fruit Company's fresh fruit catalog offers their Exotica Harvest Club for fruit connoisseurs to delight in tropical fruit delicacies from Pomegranate fruit to Ugli fruit! You'll feel like you're in a tropical paradise with boxes of Kumquats, Feijoas, Passion Fruit, and even more exotic treats delivered throughout the year! Shop for delicious varieties of fruit for your family or for a gift basket for friends and colleagues during the holidays. When it comes to fruit catalogs, taste the difference when you buy fruit online from The Fruit Company.